He's back home, the historic Lake Oswego Hunt Club, where the mounted patrol horses were stationed previously. As Zeus whinnied in delight to get out of his stable, his mocha-colored coat shimmered in the sunlight. At his new home at the historic Lake Oswego Hunt Club, he lives with the memories of when his fellow mounted patrol horses were stationed in the same barn, calling the same stables their home. But with 43 horses filling the stables now, Zeus is far from lonely. In fact, just like old times, he recently injured himself by kicking his leg through a fence while playing with the others. "Zeus is famous for injuring himself," said Taryn McAllister, who adopted him when the unit disbanded in 2017. "This seems to be a regular thing for him, so once a year we get to do some rehab." Last year, he injured his annular ligament, and the year before it was his stifle, which is a horse's largest joint, she said. McAllister has been riding horses for 27 years. She was formerly a stable attendant for the mounted patrol unit from 2016 to 2017, when it disbanded. She was hired this January as director of the Hunt Club. 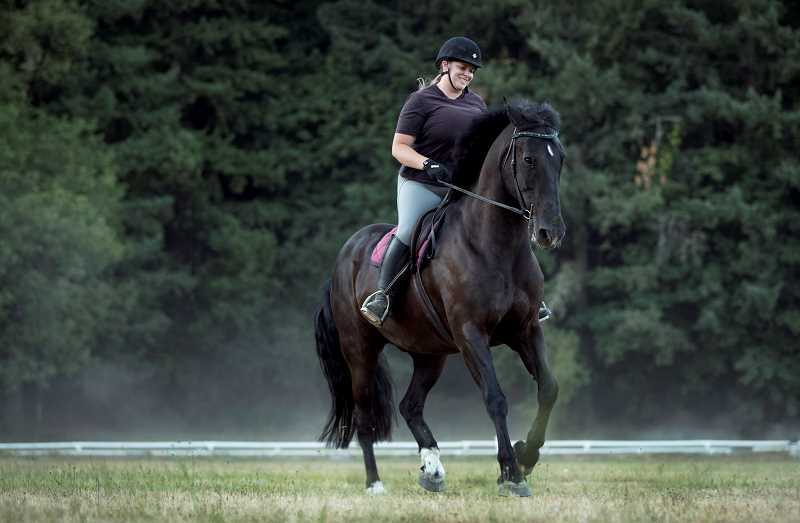 When she was with the Portland Police Bureau, she took care of all eight horses in the unit. But Zeus had a place forefront in her heart, she said. "We always kind of joked that I was going to take Zeus when he retired because he was one of my favorites. But I wasn't looking for another horse," she said. "It was kind of an unexpected scramble on my end." McAllister said she adored him too much to say no. She said in 2016, when she was hired, Zeus was the first horse she did anything with. McAllister said she walked with him side-by-side instead of riding. "I got to go hand-walk him. So that's my very first memory of Zeus, is trying to walk him around and have him stay quiet and not have him drag me to the ground," she said laughing. It "probably set the scene for him being my favorite." McAllister said Zeus' wits are what drew her to love him. "He's always thinking through everything and so I have to be aware of what I'm doing all the time," she said. "Or he'll remind me that I'm not." But it's also because of his willingness to do any activity ... if a cookie is involved, that is. "He's a total cookie hound; that horse will do anything for a treat," McAllister said. "All horses are food motivated but he takes it to the next level." Lately, they've been doing light work like some dressage, low-level jumping and short trail rides to ease him back into health. McAllister made kissing sounds to Zeus and he swished his tail, then stomped his front feet as he heard the familiar crinkly sound of a peppermint wrapper. Sure enough, McAllister pulled one from her pocket and he wouldn't stop licking her hand as if she was holding more. McAllister said all the police horses loved treats just as much, and when the unit was disbanded, it was hard to let all but one go. "It was heartbreaking. There's no other word for it because they were ours," she said. It was heartbreaking for the city, too, she added. "Horses created really positive interactions with the public and the police that I think especially right now, is desperately needed," McAllister said. "Anyone will approach a cop on a horse, whether they like police or not." At the Hunt Club, some people still use Zeus' nickname from the mounted patrol unit, "Z." "But 'Zeus' fits him," McAllister said. "He very much thinks he's king." And he's still saving the day by patrolling the barn playing pens and conquering bullies. "He doesn't take any flak from anybody but he won't hurt them, he'll just push them around," McAllister said. "I have a mini horse who pushes everyone around and thinks he's very funny. He went out with Zeus and Zeus taught him that he was small." Yet at the same time, Zeus still shows his playful side by using other horse's fly masks to start tug-o-war matches. McAllister said the distinct personality is exactly why she loves him, and why she misses the other seven. "They were some of the best horses I've ever met and I've been in this a long time," she said. "That was the beauty of the police horses, is they're all kind of jacks of all trades. They'll do anything for you."